My friend Nick recently traveled to a few countries in Europe, and when asked what his favorite meal he had there was, he answered polenta e casura, a specialty of Milan. (Judging from my success at Googling the dish, assuming I have the correct spelling, it is a closely kept specialty of Milano cuisine, too.) 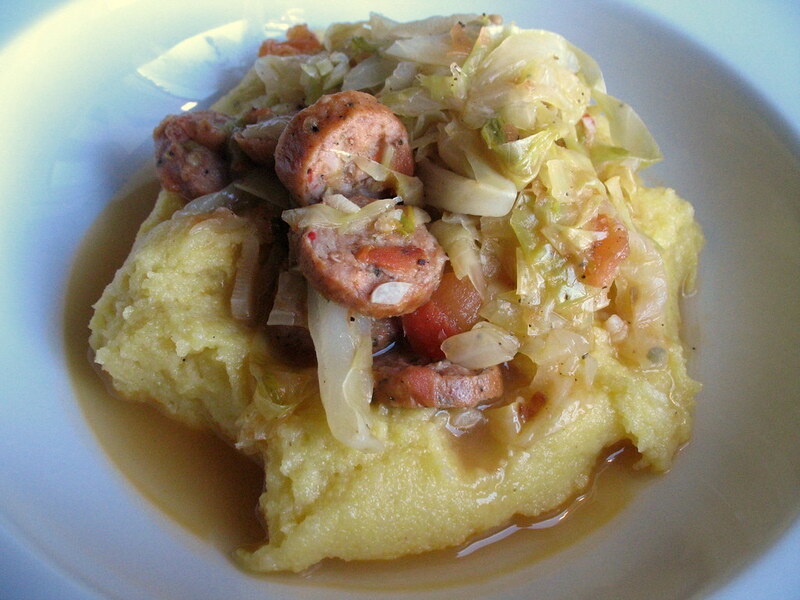 In any case, the dish sounded soothing, comforting and rustic: braised cabbage and sausage, with polenta on the side. What could be simpler yet more satisfying than that? There may be much more to the authentic dish than that, some wine perhaps, an intricate stock. But I was tickled to realize this morning that I coincidentally had all the makings for a basic version at home. I’ve been glancing at this package of spicy chicken sausages in my freezer every time I open it for months now. I didn’t buy it. A friend of mine did, on a grocery shopping trip just before coming to a get-together at my place, and accidentally left it behind. So I stashed it in the freezer for safekeeping. I know, it’s like, who leaves groceries such as sausages in their friends’ fridges? Extremely busy people, that’s who. People who didn’t have time to stop at home. And people who still haven’t had the chance to meet up and get it back. Well, I’m sorry, Aaron, but I’m just going to eat these now. According to Mario Batali, according to Bill Buford in Heat, celery leaves are the most flavorful part of the plant. 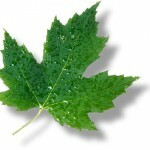 This works out great for me because I like to eat the stalks raw, but I don’t enjoy the leaves that way. So I try to cook with them before they wilt. I ripped off a handful of leaves from my bunch and chopped them up along with garlic to throw in the sizzling olive oil. 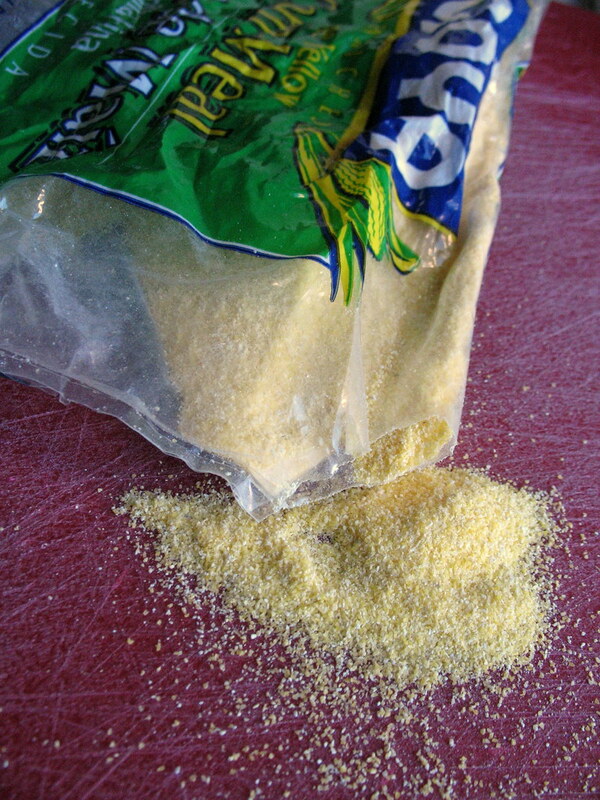 Speaking of Heat, if you also read it and recall the part about making polenta, you might have been as surprised as I was to learn that the classic preparation for this cornmeal mush is to cook it, stirring laboriously, for several hours. Avoiding the volcanic glops that spurt from the center of the pot, as poor Mr. Buford endured. Well, the way I always cook polenta, to self-satisfactory results, is in about ten seconds. Just get some water boiling, whisk in some fine yellow cornmeal (it doesn’t even have to be labeled “polenta” or Italian), and presto! I don’t even bother adding butter or cheese, just a little salt, though these optional ingredients would make it that much more tasty. What a winter warmer. And unlike most wintery stews and soups, this hot lunch took only fifteen minutes to cook. If you don’t have any fresh tomatoes around, or are sticking to seasonal fresh veggies only, you might swap the small tomato for a spoonful of tomato paste. I happened to have tomatoes due to an irrepressible craving for grilled cheese with tomato a few days ago. That was a good lunch, too. In a skillet or wide saucepan with a lid, heat the olive oil on medium-high. Add the garlic and celery leaves, and stir for about five seconds. Add the sausages and stir until cooked, about 2 minutes. Add the cabbage and tomato and cook, stirring occasionally, until the cabbage is translucent, about 3-4 minutes. Season with a few pinches of salt and pepper. Add one cup of water, reduce heat to low and cover. Meanwhile, bring 2 1/4 cups water to boil in a saucepan. Reduce heat to medium, and pour in the cornmeal while whisking rapidly. Keep whisking, and in about ten seconds you should have polenta. But to continue softening the grains a little more, keep cooking on low heat, whisking, for another minute or so, adding a splash more water and whisking it in if it’s looking too dry. Season with a little salt to taste. Lift cover from pan after about five minutes of cooking. Continue cooking excess liquid off for another five minutes or so, or until consistency is just slightly soupy. Taste for seasoning, adding more salt or pepper as desired. Serve on top of a scoop of polenta. Four brownie points: The chicken sausage package says there are six grams of fat per link, which means one hearty portion of this recipe has three grams of fat plus half a tablespoon of olive oil. Not bad! 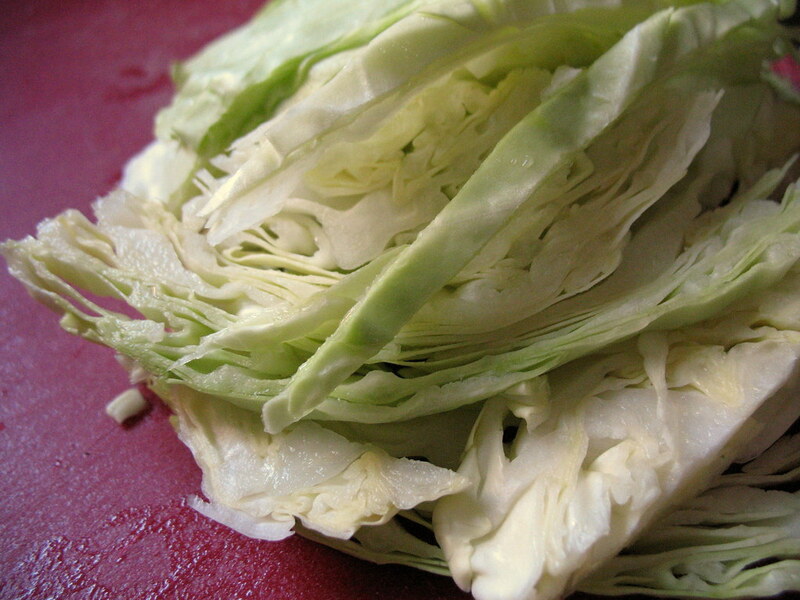 Also, never underestimate the nutritional vigor of the lowly, cheap, white cabbage. Like greener greens, it’s rich in Vitamin K, and has fiber and B-vitamins and antioxidants to keep you healthy throughout the cold months and city toxins. i wish the boyfriend weren’t so picky. cabbage is one of my favorite things in the world, but he just offers a sneer. sigh. Hi Desiree: What about swapping in kale or collards instead of the cabbage? Just a thought! I was thinking the same thing as Desiree–my husband hates cabbage but kale would be an awesome pairing with polenta and sausage. 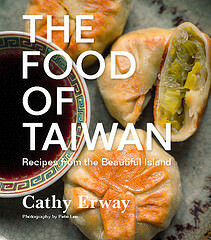 I just made this- twas excellent for post-holiday eating! Ellis: Thanks so much for catching that! (Ack!) And I’m so glad it came out well in spite. Rachel: Brilliant, thanks so much for the link! I was really hoping someone might be able to chime in on that dish. kale would be dreamy…alas the only green thing he will eat is icing. i cook for myself a lot. but the polenta! i will be making this very soon! i made this last night with a couple modifications. i could not find celery with tops anywhere! also, i threw in a can of small white beans, sauteed some chopped shallot with the garlic, and used a few dashes of cayenne pepper for spice. this was fantastic. thanks for the idea! Can’t wait to have you on the PIX Morning News! You are going to rock! Great post! This looks delicious, and is perfect for a cold winter night! at my bf’s suggestion, we modified this (greatly) to make it into a base for steamed mussels, by adding a quarter cup of white wine instead of water, then steaming the mussels. delicious, if a bit messy to eat. the cabbage was quite filling, making it a great way to stretch a bag of mussels. delicious, and soon to be done minus the mussels. Just finished having this for dinner, and it was delicious. I had a stalk of celery, but alas Whole Foods cuts off the top of the celery they sell, so no leaves of which to speak. (The Park Slope Food Coop does not cut off the top of their celery, for anyone who is looking for celery leaves in brooklyn.) It was absolutely delicious. Thanks! This sounds terrif. Maybe it’s the economic downturn or just the dead of winter, but homely, unsung heroes like cabbage are really appealing to me right now. Add the sausage, and it’s a date! Delicious! 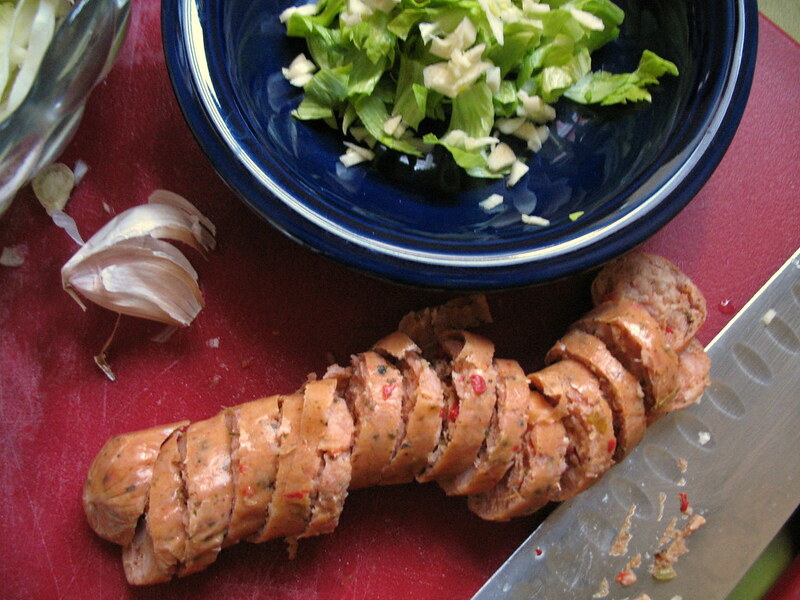 just made w/apple sage vegetarian sausage and on Nora’s suggestion, added some apple cider vinegar – very, very tasty and comforting. Thanks Cathy! would love to have this for lunch today! Made this last night, had some leftovers today for lunch too. For the sausage, I used a habanero-chili chicken/turkey combo. I made it with regular corn meal and it turned out fine, and only had to stir for about 5 minutes. I think it came out as more the American style “corn meal mush” however, I think polenta and mush are the same thing maybe. I added about a teaspoon of spicy brown mustard, the kind with the whole mustard seeds, to the cabbage. Thanks for an absolutely stellar, fast, healthy recipe! 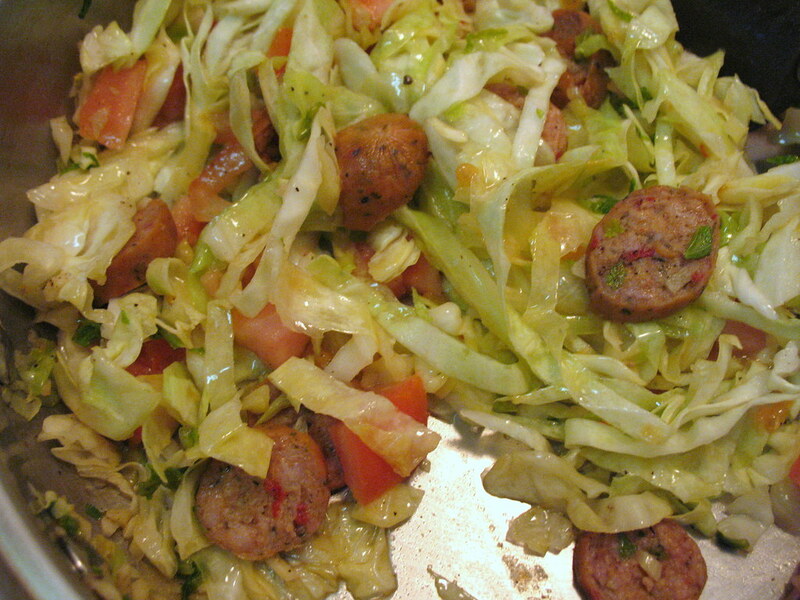 I’m growing cabbage for the first time this year and was looking for something to make for dinner that also included sausage. 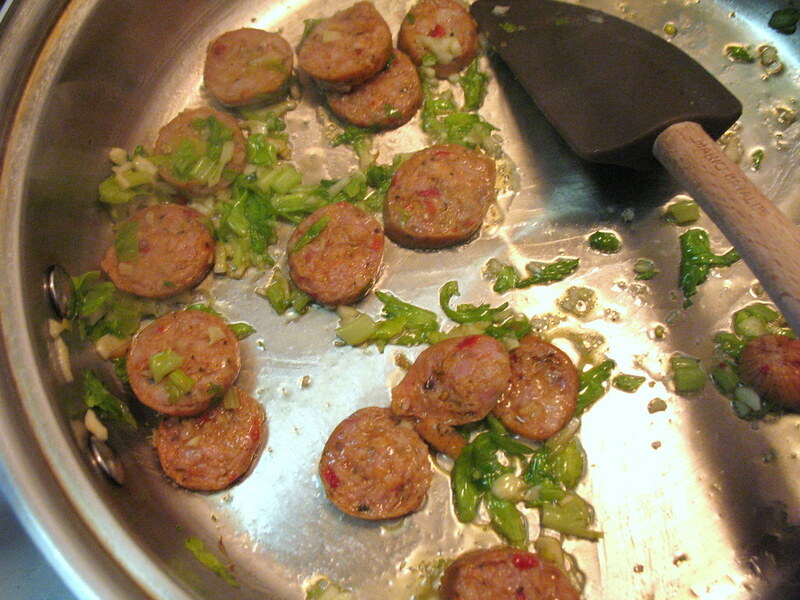 I had some unseasoned, whole-hog sausage (very lean), and seasoned that with some fresh sage, fennel seed, and just a bit of raw sugar, then formed and cooked sausage patties. I removed the patties after they were cooked, then braised the cabbage in the same pan, leaving the brownings in the pan. 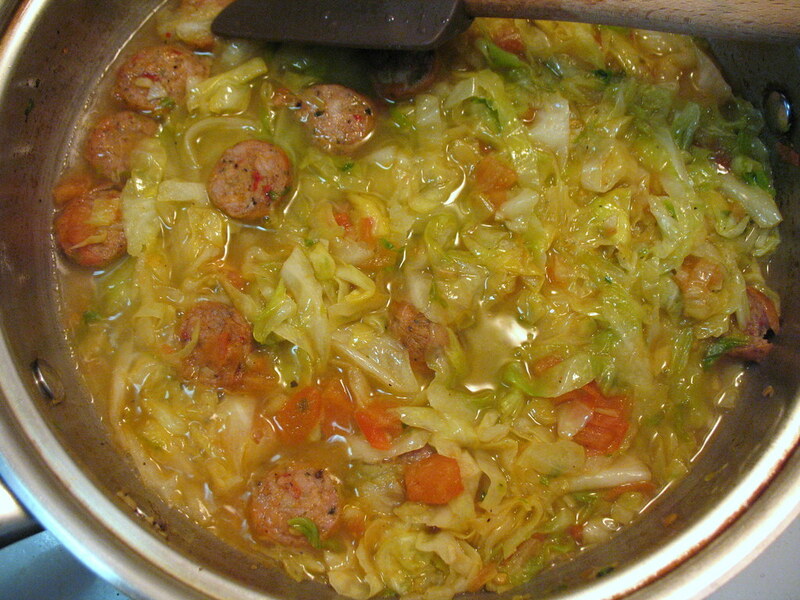 Once the cabbage was wilted I stirred in the water, then added the sausage back to cover and simmer. The result was amazing! None of my kids or partner like cabbage – but they all ate it and had seconds – I never dreamed anyone but me would eat the cabbage! Thanks so much! P.S. I did the slow version of polenta – once it was thickened I buttered a bowl, spooned the polenta in and let it set for 10 minutes. After ten minutes I inverted the bowl onto the plate and had a magnificent, formed heap that could be topped with cheese and sliced (as the Bob’s Old Mill cooking instructions on the bag suggested!) Wonderful dinner – thanks! !